"Start spreadin' the news"... help is on the way for the city that doesn't... score. The Rangers have some major league offensive talent in the system that could make any Rangers fan forget about how much money Sather invested in Drury, Redden and Rozsival! Yes, they are that good! Consider that the Rangers tragically lost Alexei Cherepanov, possibly their top prospect, to a shocking in-game collapse in 2008; and their list of up and coming talent is even more impressive. Derek Stepan, C - #51 overall 2008 Draft. An excellent playmaker, Stepan had more assists than games played this past season at Wisconsin. 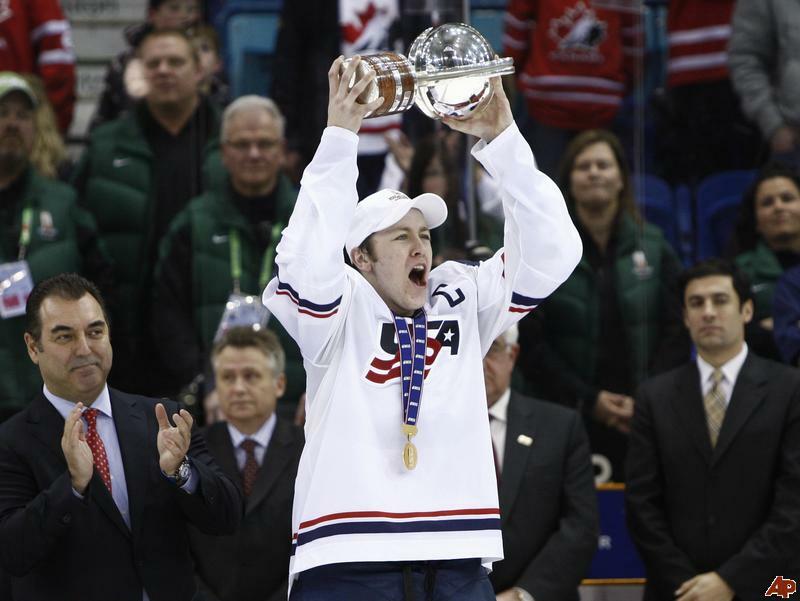 He was the captain of the gold medal winning U.S. WJC team and was the tourney's leading scorer. Chris Kreider, LW/RW- #19 overall 2009 Draft. Highly coveted for his skating ability, Kreider has size and hands to go with his speed. Another member of the gold medal winning U.S. WJC team. He has enjoyed goal scoring success in his freshman year at Boston College. May turn out to be the perfect complement to Stepan forming a deadly duo in the near future. Evgeny Grachev, LW - #75 overall 2008 Draft. A power forward, with good hands, excellent puck protection skills, and is responsible defensively. Was the OHL's rookie of the year in his only season in Brampton. Has not shot the lights out in the AHL, but power forwards generally do take longer to find their game. Bobby Sanguinetti, D - #21 overall 2006 Draft. Another great American-born prospect in the Rangers' system. Excellent skater and offensive skills. He has seen some time with the big club already, but needs to add a bit more weight/strength while focusing on tidying up in the defensive zone. Has elite skills, just needs a bit more time. Ryan McDonagh, D - #12 overall 2007 Draft by Montreal. Acquired via trade in June, 2009. Was a footnote in the Scott Gomez trade, but no longer to Rangers fans. He is the nephew of former NFL quarterback Steve Walsh, so one might expect him to be a natural power play quarterback, yet McDonagh's forte is the penalty kill. A good skater, with some skill, but has a big body: more in the mold of a Brooks Orpik than Brian Leetch. More offensive support will not only make franchise goaltender Henrik Lundqvist a happier man, but like Luke Skywalker, will bring balance to a team on the verge of serious contention.